This is an exquisite children’s book, full of heart. In the 1940s, a young boy and his father leave Alabama for work up North, where the boy discovers a public library “not just for coloreds,” and finds solace in the words of Langston Hughes. The book has excerpts of Langston’s poetry that bring all the emotions alive: being uprooted from the southern community; struggling to make sense of cities; dealing with loneliness and loss of loved ones. Throughout this small children’s book, we see a young boy struggling to come of age and be true to himself. He loves words, he loves books, and he discovers how to make that a valid choice. This is also a book about reconciliation between father and son, when the father had so much pain and worry, he wasn’t able to see his own son clearly. Yet love does triumph, and they come to see each other with great heart in the end. This is an excellent children’s book for African-Americans who would like to read of the experience called the “Great Migration” that took place after the war. Though it is not categorized as historical fiction, it does a great job of bringing the past into the present reader’s experience.. 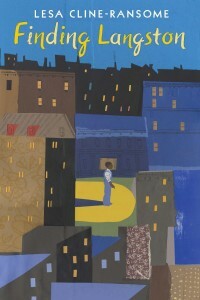 In the end, the book is about a young boy and his dad, and transcends being pigeon-holed by race, religion, or gender. It is a great example of how a young boy can be transformed by poetry and words.